Author(s): Luke Hanna, Sarah McCormick, Ian Davison. Russells Hall Hospital, The Dudley Group of Hospitals, UK. Introduction: Limited data exist about the educational value of students performing a case based discussion (CbD) to a group of their peers. Aim: To evaluate the use of CbDs in a group format as an alternative to one on one CbDs. Methods: Foundation year one (FY1) doctors were invited to present a case that they had been involved in the care of to a group of their peers. The format would involve discussing the case and relating it to current literature followed by questions posed by the lead of the session first to the trainee then to the group. The trainees would then fill in a questionnaire about the process. Results: 13 trainees participated in the exercise. All agreed that this assessment had more educational value than the standard format of CbD. 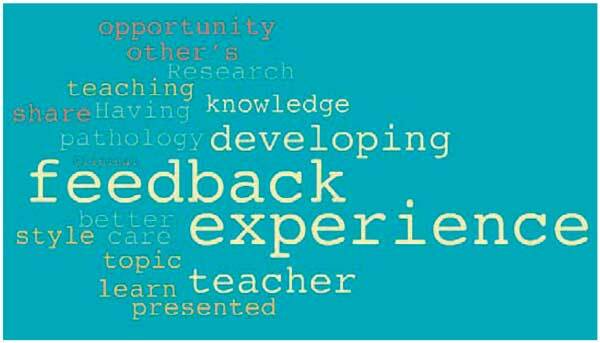 The most beneficial points about the experience were feedback, researching the topic and learning from others’ experiences. All trainees agreed that this assessment should be introduced into the foundation program. Conclusion: Presenting CbDs to a group could be educationally beneficial if added to the current foundation program. Keywords: Case based discussion, Foundation year programme, Medical education, Workplace based assessments. Affiliation:Russells Hall Hospital, The Dudley Group of Hospitals, UK. Keywords:Case based discussion, Foundation year programme, Medical education, Workplace based assessments. Abstract:Introduction: Limited data exist about the educational value of students performing a case based discussion (CbD) to a group of their peers. Aim: To evaluate the use of CbDs in a group format as an alternative to one on one CbDs. Methods: Foundation year one (FY1) doctors were invited to present a case that they had been involved in the care of to a group of their peers. The format would involve discussing the case and relating it to current literature followed by questions posed by the lead of the session first to the trainee then to the group. The trainees would then fill in a questionnaire about the process. Results: 13 trainees participated in the exercise. All agreed that this assessment had more educational value than the standard format of CbD. The most beneficial points about the experience were feedback, researching the topic and learning from others’ experiences. All trainees agreed that this assessment should be introduced into the foundation program. Conclusion: Presenting CbDs to a group could be educationally beneficial if added to the current foundation program.